Sierra Nevada Corporation (SNC) reports they are one step closer to testing the VR35K-A, a commercialized version of the VORTEX engine system, a project that is under development in a combined effort with the Air Force Research Laboratory (AFRL). 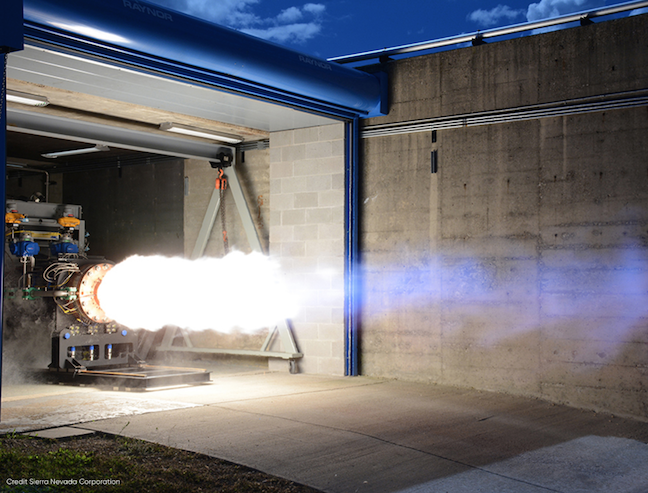 With its patented VORTEX™ engine technology, Sierra Nevada Corporation (SNC) is one step closer to testing a brand new version of its low-cost, high-performance upper stage rocket engine. The VR35K-A, developed in conjunction with the Air Force Research Laboratory (AFRL), is a commercialized version of the VORTEX engine system. The team will provide a fully integrated engine, leveraging technologies initially developed under Small Business Innovation Research programs. SNC’s owner and CEO, Fatih Ozmen stated that they are committed to using technology that is cutting-edge, but also cost-effective, and the VR35K-A is a great example of both. This solution shows how small business technologies can be accelerated into valuable applications for commercial and military use. SNC partners with several other small businesses for components and key subsystems of the engines. SNC is expanding on its legacy success with the VORTEX technology, using it as the baseline for the next-generation liquid oxygen and liquid hydrogen upper stage class engine. State-of-the-art technology and a VORTEX flow field to cool the inner walls allows the new engine to be simpler, smaller and lower cost. The overall size of the engine is also drastically smaller in comparison with traditional combustion upper stage engines, making it up to 50 percent cheaper. Tom Crabb, vice president of SNC’s Propulsion and Environmental business unit added that AFRL has a history of developing and discovering new technology that can be applied in air and space and they are pleased to continue their commercialization effort with them. SNC’s VORTEX technology is truly a unique new value to future launches and they are both excited and motivated to see this program move forward. Testing will continue at SNC’s upgraded rocket engine test facilities near Madison, Wisconsin. Several important commercial, civilian and military applications are planned, including small engines used in orbiting spacecraft and vehicles and larger upper stage engines for final orbit delivery. Other launch and boost applications will also be tested. Dr. Shawn Phillips, chief of the Rocket Propulsion Division at AFRL concluded saying that AFRL is always looking for innovative solutions, and SNC’s VORTEX technology in the VR35K-A rocket engine adds a new high-performance and low-cost option to the upper stage engine capabilities space for launch providers.